Take a Seat is an ongoing series of public furniture installations aimed at increasing the availability of seating options in New York City subway stations. Perfectly functional chairs are rescued from trash piles and reassigned to stations where limited seating options leave subway patrons no choice but to stand for extended periods of time. Take a Seat creates value simply by relocating an object to a new location. Rescued chairs—once liabilities—become assets with little to no effort. Seating solutions installed for Take a Seat are not affixed to MTA property in any way, opening up opportunities for collaboration with subway patrons who, if they take the initiative, may continue the project by installing the chairs in other locations that could benefit from more seating options. Why? More than 5 million riders pass through the New York City Subway system every day, sometimes waiting as long as an hour or more for their trains. Unfortunately, benches intended for waiting passengers are sparse and inadequate, leaving many riders standing. According to NYC MTA’s founders, “the subway should be an inviting and pleasant environment, geared to the user, with the highest levels of design and materials.” I agree! What is more pleasant than sitting while waiting for your train? How To Participate: Simple! 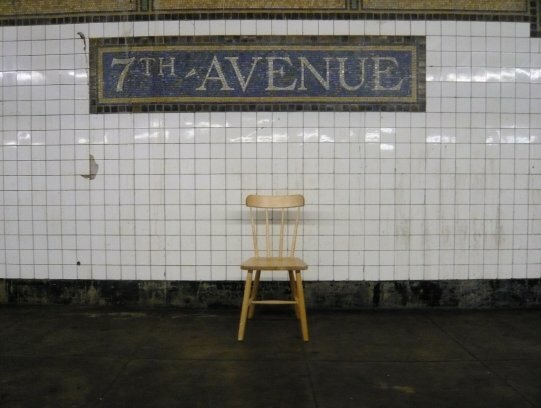 If you see a chair in the trash, snag it, clean it up, and take it to your nearest subway station. If you like, take a photo, send it to me, and I’ll post it here! It will be a collaboration! It is okay if you don’t live in New York City. If you are in a different state, it will be a national collaboration! If you are in a different country it will be an international collaboration!